In the Ruins may be the most disturbing and depressing book I have ever read. It was never for one moment easy to read, and often I could only read a few pages at a time before touching it again for a week because it was so emotionally difficult. But after finishing it, I am immensely glad I read it. This is one of those rare books that imparts knowledge through pain and experience, a kind of knowledge you could never get any other way, a kind that is difficult but deeply important. I was incredibly relieved when I finally finished In the Ruins, but I know I will be haunted by what I learned from it for the rest of my life. 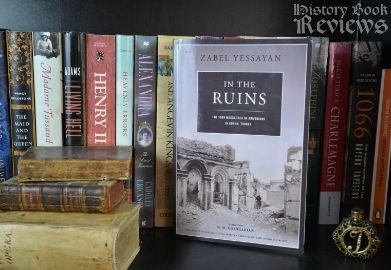 In the Ruins was written as a memoir by Zabel Yessayan, an Armenian intellectual woman, after going to Ottoman Turkey to do relief work following the 1909 massacres of Armenian people by the Turks. This book is a testimony to what she encountered, what conditions were really like for the Armenians who were killed and for those that survived. These 1909 killings are considered by many a precursor of the Armenian genocide of 1915, when more than 1.5 million Armenians were systematically murdered by the Turks. Yessayan's account is extremely important, because this genocide was largely covered up and even today there are people (and political leaders) who argue that it was not a genocide at all. As a result, this event has become somewhat obscured in historical memory. Most people have never heard of it at all, despite its ranking as the second worst genocide in recorded history; the first, of course, being the Holocaust. I only knew of it vaguely before reading this book because one of my favorite bands, System of a Down, has Armenian members and they have done work to promote awareness of the genocide and to have it officially recognized. 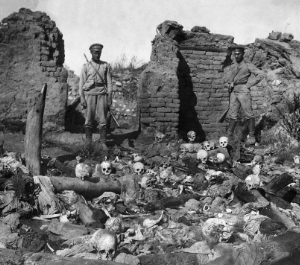 Turkish soldiers stand among the remains of Armenian dead, slaughtered in the genocide of 1915. In the Ruins has an incredible power to evoke deep feelings. Despite being written over 100 years ago, the writing is immediate and engaging, and so full of emotion that it hit me like a bulldozer. I cried when two orphaned children adopted each other as brothers because they had no family anymore; I felt sick to my stomach when women strangled their babies so the crying wouldn't give away their hiding places; I had to put the book down when the descriptions of the brutal murders and the suffering of the victims worked their way into my soul like poison. When we hear of history, all the world's tragedies can seem the same. They are all terrible but they are somewhat removed, and a global perspective reminds us that there can always be something worse happening somewhere else. But this level of personal writing brings home what happened to humans on an intimate scale and it is deeply painful to read, though it reminds me how vitally important it is to remember. I have to call attention to the translator of this work, G.M. Goshgarian, for his incredible and impressive work with this book. Having done some translation work myself, I know how complex and difficult it can be, as well as how underappreciated. I can recognize a brilliant translation when I read one, and I saw it in this book. Yessayan's original words and phrasing must have been beautiful, but Goshgarian made them accessible and familiar to English speakers while retaining the poetic renderings and the emotional expression, which is not an easy task. His translation skills have played a huge part in ensuring that these 1909 massacres will not be forgotten in the western world, and he has lent his own quiet beauty to Zabel Yessayan's century-old words. There are moments of loveliness in this account that are unexpected. I was really struck by the story of a Turkish prison guard who didn't agree with the massacres, and snuck the prisoners food and money, his own life savings, so the Armenian prisoners could grow strong and see their families. That was a powerful reminder that good and evil can never be defined by race or religion, and that there are wonderful people in the world of every religion, race, and culture. The book ends with exquisite imagery of rebirth and healing, of "rising from the ashes". I wanted so badly to be happy about this, but it was hard to see it in a positive light knowing that the true genocide was yet to come and that it would get much, much worse for these people. Ultimately In the Ruins is a deeply important book, I cannot stress that enough. It is a powerful and badly needed reminder for cultural and historical memory, as well as being a work of art that is sometimes beautiful and sometimes ugly but always tragically impactful. Zabel Yessayan suffered herself greatly in her relief work and in the writing of this book so that this massacre and all the lost lives would not be forgotten. It is not fun or entertaining to read about this kind of horror, but it should be read so that it will be remembered. I know I will never be able to forget it. A very special thank you to Barrel Maker PR for recommending this book and sending me a copy for review. Visit their page here! If you would like to recommend a book for me to review, contact me here. I always love getting new suggestions!